TimeZone : Zenith » 3 Chronographs, 3 Classic Movements. 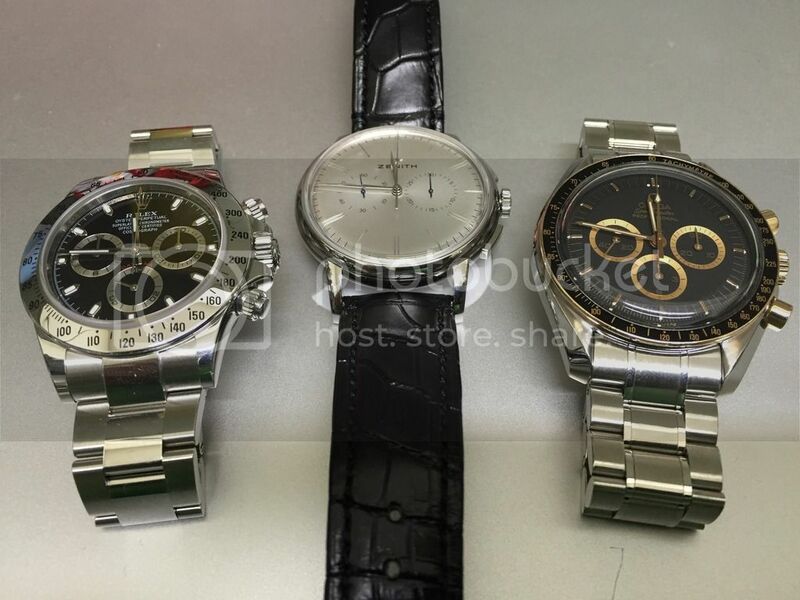 3 Chronographs, 3 Classic Movements. Today, the balance wheel in most mechanical watches beats at 28,800 vibrations per hour (vph); if you look closely, that smooth seconds hand sweep is actually eight ticks per second. The El Primero, on the other hand, is what's known as a high-beat movement, making 10 ticks per second, or 36,000 vph (vibrations per hour). Not only does this create a smoother sweep, it also allows the chronograph function to maintain accuracy down to 1/10 of a second. High-beat movements were rare in 1969, and they're rare today. Even Rolex slowed the El Primero down to 28,800vph for their Zenith powered Daytona 16520. Omega Speedmaster Professional with the iconic caliber 321 movement performed well and it didn't need any regulating. The cal.321 movement was produced since 1946 and used in the Speedmaster Professional till October 1968. After that, Omega started using the cal.861 movement, which had lesser parts and thus cheaper to produce for Omega. Omega used it till 1997. Nowadays, Omega uses the cal.1861, which has a nicer finish and an extra jewel (18). The Lemania 1861 movement has changed very little over the history of the Speedmaster Professional, and for good reason. If it ain't broke, don't fix it. It is now rhodium plated (which is the difference between the 861 movement, and the 1861 movement) for additional corrosion resistance, and that's about it. By design, the 4130's vertically coupled approach enables absolutely precise starts and stops of the chronograph seconds hand. When started, stopped, or reset, no unwanted jitters are seen on any of the watch's hands. The vertical clutch also allows the chronograph to run continuously for extended periods, with no impact on timekeeping accuracy. Understanding Rolex's longstanding, noble pursuit of maximum timekeeping accuracy, their decision to use a vertical clutch makes sense. Compared with the 4030, the 4130 is much easier to service. A few little known "insider" facts: a) The 4130 uses 12 different screws versus more than 40 found inside the 4030. b) The 4130 has roughly 20% fewer parts than the 4030, which yes, is a good thing. c) The 4130's mainspring can be replaced without taking the movement out of the case. A 4030, on the other hand, requires a full overhaul in order to replace the mainspring. Many respected watchmakers will confirm: The caliber 4130 set a new benchmark among high-end, self-winding chronograph movements.